A Great Budget Makes a Great Retirement! Interested in lowering your anxiety and maximizing your happiness? 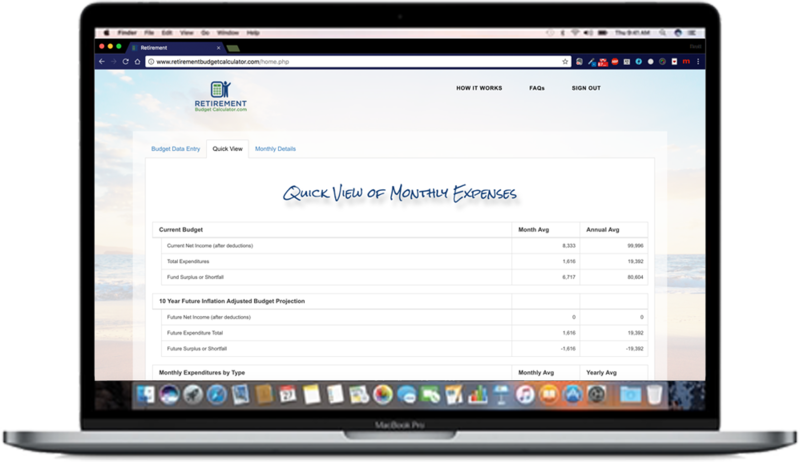 Retirement Budget Calculator is an easy to use online monthly budgeting calculator that helps you plan a realistic budget for retirement – protecting all of your hard work and giving you an honest look at your expenses. "Have we saved enough to be able to have the same quality of life in retirement?" "Will unplanned medical bills make our finances spiral out of control?" "Will we be able to do the things we have always dreamed about?" "How will inflation impact our spending over time?" The peace of mind you have always wanted for retirement can be yours with just a little bit of effort. Go ahead! Click the button to Maximize Your Retirement Happiness!